A parish is a place, but more than that, it's a people, and in celebrating a 100th Anniversary, we celebrate the people who have made and continue to make Sacred Heart Parish such a special community. In the lives of so many people, "our parish" has an important place in our journey. The community into which we are baptized, with whom we share the Eucharist for the first time, that supported The Catholic education we received, which called us to confirm our faith, that provided the setting for our Marriage celebration, and even ritualized the passage from this life to eternal life for friends and loved ones holds a cherished place in our hearts and in our memories. The parish is the context for people to encounter Jesus. Almost two thousand years ago, Jesus was sent in the fullness of time to be our Savior. During his life on earth, he called disciples, formed them by his words and actions and sent them forth to continue the ministry he had begun. Thus, the mission of a local church is to continue that work of preaching the Good News, calling new disciples, forming people in faith and developing outreach to those in need. It is in the context of the history of God's saving work that parishes are established. On October 11, 1892, Sacred Heart Parish was born. Although the parish was established in 1892, the baptismal and confirmation records point to the relationship of the parish to St. Mary's Orphanage. No history of Sacred Heart would be complete without an account of the tremendous contributions of the Sister's of Charity of St. Elizabeth. One of the first works of the sisters was St. Mary's Orphanage which was founded in 1859 and was situated on South Orange Avenue across from the Church, now the site of St. Mary's Villa. The first Sister-Servant was Mother Mary Xavier Melegan, and it could be said that the first parishioners of Sacred Heart were the residents of St. Mary's. When Rev. James McManus began the parish, worship took place in the chapel of the orphanage. A rectory and school building were located at the corner of Tremont Avenue and Sanford Avenue, East Orange. The first Sister-Servant of the school which opened in 1893 was Sr. Mary Austin O'Toole. It was in 1910 that a combination church and school building was constructed on South Orange Avenue near Sanford Avenue under the leadership of Fr. McManus and for the first time mass was celebrated in a place that the parish could call its own. By that time, the original rectory had been moved to the new church property in Newark. The Reverend R.E. Freeman served as pastor for a brief period, but it was the pastorate of Rev. Henry G. Coyne that saw a time of tremendous growth for the parish. In order to respond to this growth, much construction was undertaken. A house at 501 Sanford Avenue became the first convent and it enabled the sisters who taught in the school to move out of the orphanage. The present rectory was a two-story addition to the school / church building. However, the growth in the size of the parish, created the need for a new Church building, and plans for such a structure were commissioned. A significant engineering feat preceded the construction of the church, for it was decided to move the school ninety feet west and forty feet south. Since the building was four stories high and weighed 3,000 tons, this was an impressive undertaking, and it was accomplished literally inch by inch taking a month to complete. The Church building was dedicated on June 9, 1929, by Bishop Walsh, Father Coyne and the homilist was Rev. Fulton J. Sheen, then of Catholic University in Washington, but later Bishop of Rochester and a noted homilist especially famous for his television programs. As the largest parish church in the country at that time, the church remains today in almost the exact form that it was when it was dedicated. The architecture of the Church is Italian Renaissance and it's interior without columns is spacious. With the pews in the two balconies, seating for 2,500 people is provided. The marble altar rails contains the images of the twelve apostles, and the beautiful stained glass windows depicted the apostles, saints and old testament figures. The marble and columns were carved in Italy. Msgr. John J. Murphy succeeded Fr. Coyne, serving as Pastor from 1932-1952. The parish debt was paid off during his term, and the parish continued to grow. During the Second World War more than twelve hundred parishioners served in the Armed Forces, including two priests who had served the parish and became chaplains. 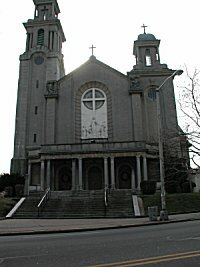 When Archbishop Boland was installed as Archbishop of Newark, Sacred Heart Church was the setting, and soon after this celebrated event, Msgr. Paul Leo Collins was named Pastor. Although Msgr. Collins only served three years, the present convent was built during that period. Another significant event in these years was the formation of Immaculate Heart of Mary Parish in Maplewood, which cut off a section of the parish south of Mt. Vernon Place. The next pastor to be appointed was Msgr. Thomas Conroy who arrived in 1956. The school building needed to be replaced and under the leadership of Msgr. Conroy, the current school was built. This large and modern facility provided thirty-two classrooms, office space, a large kitchen and a cafeteria / parish hall that is used by the parish, school and numerous community organizations. During the past twenty years, the parish has been served by many priests, sisters, deacons, seminarians and dedicated lay women and men who have developed programs of ministry and service. The Pastors who have served the parish include Msgr. Joseph Tuite, Msgr. Edward Larkin, Rev. Myles Varley and Rev. Alfred Zemeikis. The removal of Vatican II introducing updating in the Liturgy, restored rites of the sacraments, and parish consultative bodies such as the Parish Council. In 1992, a new Parish Pastoral Council was formed, and together with a Finance Council and a School Board offer advice to the Pastor, Principal and others in the work of the parish. 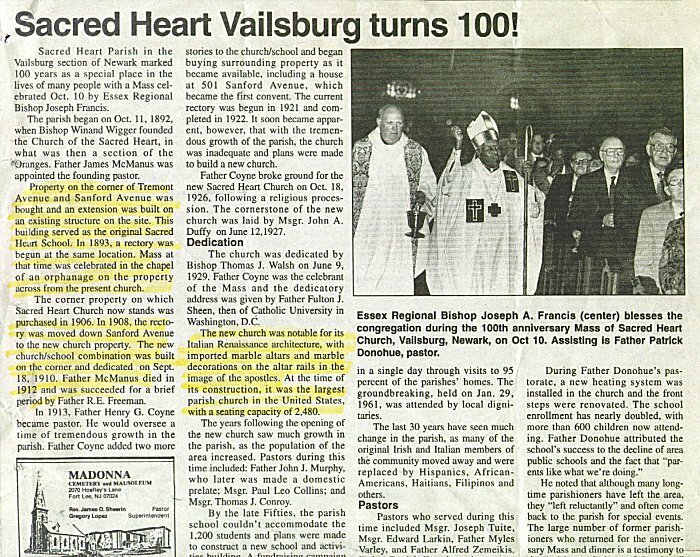 The 100th Anniversary Celebration was begun in October, 1991, with a Mass and breakfast. During the year, various events were sponsored by parish organizations. In the fall, the front steps on South Orange Avenue were reconstructed, allowing access to the main doors of the church for weddings and funerals. A new heating system was installed prior to the winter and is providing a warm environment for Masses and other liturgies. The parish also hosted other events during the year, serving as the location for the Installation of the Lutheran Bishop for New Jersey, Bishop LeRoy Riley as well as the concluding liturgy for the Pax Christi National Assembly which was held at Seton Hall. The mass was celebrated by Bishop Walter Sullivan and Dom Helder Camara, former Bishop of Olinda and Recife, Brazil. The school enrollment has nearly doubled in the past three years to 600 children. The current principal is Brother Patrick Byrne, an Augustinian, and a dedicated faculty has expanded the curriculum by providing a wide variety of after-school programs. A Catechetical Program is also provided for children as well as adults through the Rite of Christian Initiation for Adults. The schola, the school choir is an out-growth of the music program in the school, and the choir sings at special events not only in Sacred Heart but around the Archdiocese. The parish social service program enables the church to continue the mission of Jesus to serve those in need. A food pantry was begun in 1991 and donations of parishioners has enabled the parish to help as many as 75 families per week.